Mack Brick Company seeks to build and nurture lasting relationships within the New England construction community, by offering the best products and exceptional service at a fair price. Our pledge is to maintain the highest levels of integrity, fairness, stability, and professionalism in the construction marketplace. For over 180 years Mack Brick Company has been the leading provider of the highest quality masonry products in New England. From our beginning as a Connecticut waterstruck brick manufacturer to the full service New England architectural masonry consultant we are today; our philosophy in quality has not changed. Throughout our long, storied history Mack Brick has supplied superior brick and stone products for many of New England’s landmarks in Boston, Providence, Springfield, New Haven, and Hartford. As New England’s oldest brick supplier, we believe that the combination of a well thought-out design, use of the best possible products available, and impeccable craftsmanship will produce projects that will endure lifetimes. Mack Brick prides itself on offering the best service to New England architects and the masonry industry. As a sixth generation, family owned company since 1830, our pledge is to maintain the highest levels of integrity, fairness, stability, and professionalism in the New England construction marketplace. 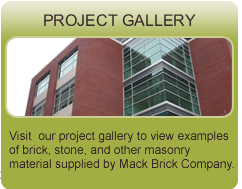 Our goal at Mack Brick is to assist you with all aspects of your New England masonry project. We provide basic brick or stone matching for building repair work or additions large or small. Let us help you achieve your vision by assisting you with product recommendations and technical data for state of the art schools, hospitals, municipal buildings, and commercial projects. Our knowledgeable staff has a lifetime of experience in the New England masonry industry and can answer questions regarding brick or stone type, aesthetics, cost-saving measures, or technical concerns. It is never too early to get our experts involved in your masonry projects. We have prepared this site for you as a tool to locate information on all of the exceptional masonry products we represent. Please do not hesitate to contact our New England masonry consultants and we will be happy to set up a time to meet you and discuss all the details of your masonry projects. Mack Brick delivers! Large project or small, Mack Brick promises to deliver exceptional service after the sale. With main line rail service to our yard in Enfield, we have the capability to depot and deliver your larger project. Need something in a hurry? Many of our products can deliver next day to Connecticut and New England. Not quick enough? We have brick and cast stone in stock in the most popular styles, ready to load on your truck. Let us show you how Mack Brick delivers.